Hausser Scientific is the world's leading manufacturer of hemacytometers and counting chambers for all applications. 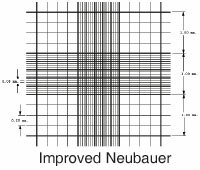 The Brightline hemacytometer features an easy to see improved Neubauer ruling and a "V" shaped opening at each end for easy loading from a capillary tube. Durable construction insures long life. Tight budget? Economy hemacytometers start at 223.19.